Welcome to the Look Out Spring: Here She Comes Giveaway! Last week, I wrote a review of IzzyBee Creations adorable accessories sent for my Nugget. WIN some IzzyBee Creations Fandangle for your little one!!! 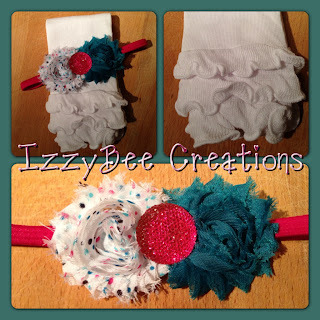 IzzyBee Creations is going to give one The Nurse Mommy reader an adorable spring themed headband and legwarmers set! We like to call it "Look Out Spring: Here She Comes!!" Here's some pictures of her legwarmers in action modeled by her little cutie!!! One winner will receive the "Look Out Spring: Here She Comes" gift set. Giveaway runs from May 14-31st. ALL ENTRIES ARE VERIFIED. Good luck! Please enter via Giveaway Tools Entry Form below. I love the Apple Green Romper! I love the medium chevron bows! I love the Daisy Clippies in blue and denim!